Wow! It’s been a while. I am back in NYC after spending the summer at our house in the Berkshires. Takeout is not an option up there and restaurants are a good drive away. So, my kitchen was very busy — I cooked 3 to 4 meals a day depending on whether Charlotte ate dinner with us. But I found it tough to fit blogging in. Since returning to real life in the city, I’ve made some post-Labor Day resolutions. Getting back to my blogging is one of them (as is staying away from carbs). So be on the lookout for some new recipes! 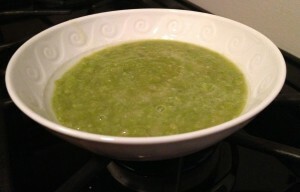 It was a rainy morning so I decided to make this very easy pea soup while Charlotte was at school. She loves soup. And the recipe is from my favorite source, the Barefoot Contessa. Just a couple of notes on the recipe. I used frozen peas because that is what I had on hand. And, I used my immersion blender to save myself from cleaning my blender. ME: I love peas and really enjoyed the soup. It is light and fresh and actually takes good cold as well. Next time I might add a bit of pancetta or bacon. CHARLOTTE: My three-year-old first declared that it was “disgusting” based on nothing other than its color. She then tasted it and said she liked it. But chicken soup and black bean soup still reign supreme for her. Puree the soup in batches: place 1 cup of soup in a blender, place the lid on top, and puree on low speed. With the blender still running, open the venthole in the lid and slowly add more soup until the blender is three-quarters full. Pour the soup into a large bowl and repeat until all the soup is pureed. Whisk in the creme fraiche and chives and taste for seasoning.